Preprufe® SCS Membrane consisting of a polymer mesh-reinforced cavity backed by a plastic film facing the soil retention system, and faced with a non-woven, semi-permeable geotextile acting as a shotcrete barrier while allowing grout to bond to the shotcrete. Preprufe® SCS Grout Injection Ports installed prior to shotcrete placement to facilitate hydrophilic grout injection. Preprufe® SCS Hydrophilic Grout post-injected under pressure into composite sheet through injection ports left protruding through the shotcrete. The shotcrete side of the membrane enables grout to bond with shotcrete across the permeable geotextile. The Preprufe® SCS Composite Sheet Membrane is applied vertically to timber lagging or other soil retention systems. Shotcrete is then placed directly against the geotextile side of the membrane. 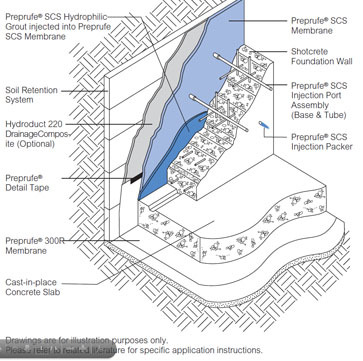 Unlike conventional waterproofing systems, Preprufe® SCS waterproofing system has injection ports to facilitate grout injection into a pre-created cavity space, forming an in-situ monolithic grout membrane with uniform thickness. After shotcrete placement, injection of the specially formulated Preprufe® SCS Hydrophilic Grout fills and seals the system, thus providing ultimate waterproofing protection. All components of the specially developed Preprufe® SCS System work together to form a continuous and integral bond to the structure, eliminating lateral water migration between the membrane and the shotcrete. When properly installed and grouted, the Preprufe® SCS System will protect against water ingression.